Belarde Company is the largest licensed Bomanite contractor in Seattle and the Pacific Northwest. Our specially trained concrete professionals are dedicated to the highest standards of quality and service. As skilled craftsmen, we deliver innovative and extraordinary architectural concrete paving and flooring solutions. Bomanite is a name synonymous with the innovation and development of decorative, imprinted concrete. Over the last 50 years, Bomanite has developed new systems for various toppings, concrete overlays, coloration systems, stains, concrete dyes, and polished concrete. These systems of products complement the proven imprinted concrete techniques and pervious concrete system, Grasscrete, that put the Bomanite brand on the map over fifty years ago. The Belarde Company as a Bomanite licensee continues to distinguish itself as the best in the industry. To guarantee consistently high standards, the Belarde Company continually invests in training and innovation to offer owners and the design community with the latest technology in architectural concrete applications. Bomanite Imprint Systems are cast-in-place concrete flooring & paving that adds a distinctive architectural touch to any project, together with the durability to stand up to the toughest traffic loads and environmental conditions. For over five decades, Bomanite Imprint Systems have offered homeowners and design professionals a virtually limitless palette of colors, textures, and patterns – at a fraction of the cost of traditional materials. Bomanite Imprint Systems gives you more than 100 patterns and custom tooling options with a wide variety of standard and custom coloring options. You can choose from many natural textures including slate, granite, limestone, sandstone, cobblestone and used brick. When you specify architectural paving, accept no substitutes. Grasscrete, a Bomanite Pervious Concrete System, is a cast-in-place, monolithic, pervious concrete pavement that is continuously reinforced to provide superior structural integrity. Bomanite Grasscrete is the green alternative to standard concrete surfaces providing a variety of landscape solutions while maintaining a sustainable green product design used for emergency access lanes, delivery access routes, overflow parking areas, and for intermittent drainage channels that help prevent erosion. Grasscrete has been a Bomanite System for over 20 years with installations throughout North America in all climate types. 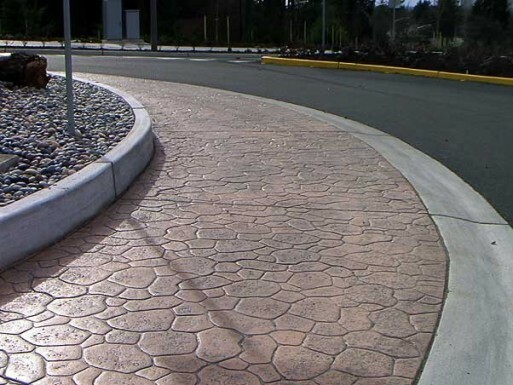 Achieved through the use of two differing techniques and three differing tools known as “formers”, Grasscrete is void structured concrete – a pervious pavement system that can be cast using proven mix designs with no potential for freeze-thaw or clogging issues. Grasscrete can be used as an exposed utilitarian product for functional applications or as a concealed system with vegetation such as grass or native ground cover installed over the concrete. This system allows you to mitigate drainage issues while maintaining strong structural integrity that allows for some of the heaviest vehicles to operate unencumbered.